Hmm! One of the problems with quoting different sources for information is that sometimes I don’t notice when they get things wrong. 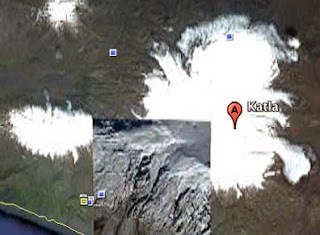 Thus it was yesterday when I wrote about the location of earthquakes near the Katya volcano. Let me correct the geography, since while there is some concern it is not quite at the stage yet that I thought it was. 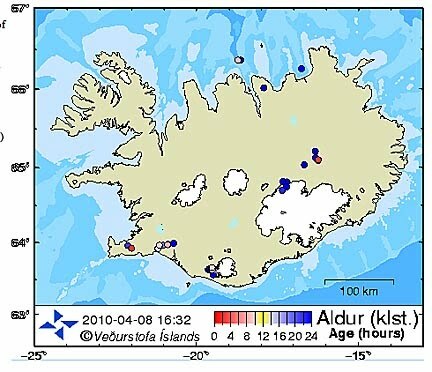 Let’s start with an overall map of Iceland from the Icelandic Meteorological Office. 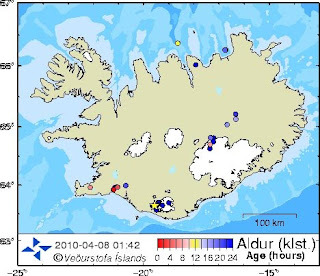 This is the overall map of Iceland, which can be accessed to show where earthquakes have happened over the last 2 days. 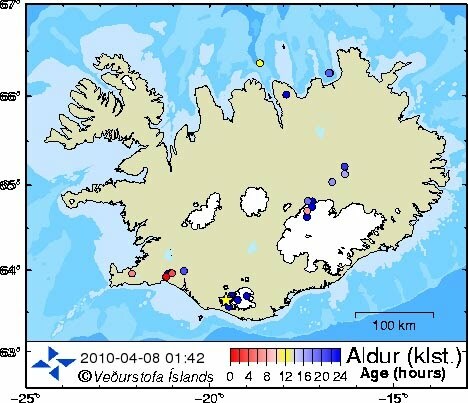 Map of Iceland showing recent Earthquakes, stars mark those over magnitude 3. Now zooming in to the area of most activity down near the bottom, one comes to two ice fields, the Mýrdalsjökull and the Eytafyallajokull, with the recent eruption being at the north side of the latter. 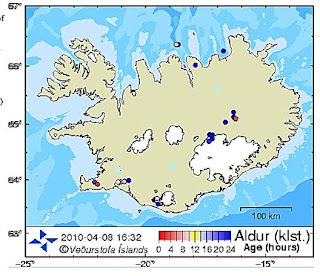 The most severe eruptions have come from Laki, which is the orange flag at Skaftareldar in the following, and it is a bit North of the current eruption. My apologies for the inaccuracy of the previous report, the sense of concern was appropriate, the location of the site was wrong. I will try to do better. 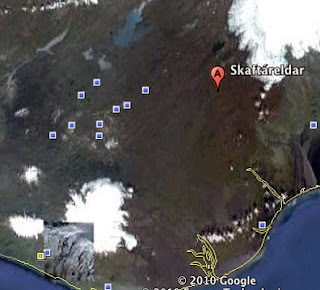 1) 4-12-2010, 63.636, -19.544, 3.1 (East side of Eytafyallajokull, apparently under the snow cap, about the same place as the first one). Oh, and while it is relatively minor, there was one on the 28th at Katla - only a 1.5, but it was at a depth of 0.8 km. Let's see if anything else develops around there. All these last 3 were offshore and within 90 minutes of one another. They were followed by a bunch of shallower and weaker ones. 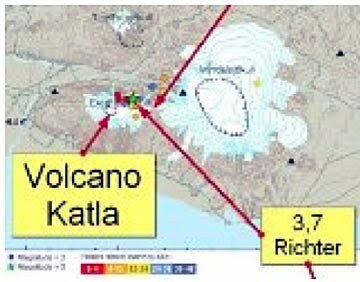 The above 4 shallow quakes all occurred within 90 minutes of one another.